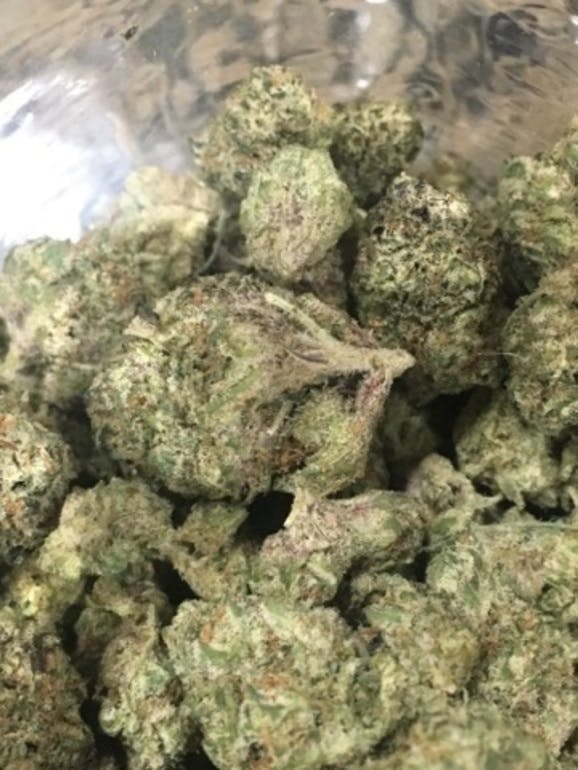 Indica Dominant Hybrid - 70% Indica / 30% Sativa - THC: 18.50% Wedding Cake is a hybrid with indica-dominance. It is attained by crossing triangle cookies x animal mints. It gives an exceptionally sweet aromatic essence and a fruity flavour. The taste is a perfect combination of sweetness of cookies and fruitiness of a cherry pie. It works as a calming agent and appetite stimulator, and is quite helpful for patients who experience regular depression-associated syndromes, fibromyalgia, MS and other such related symptoms. It may act as a sedative for patients, but does help in calming down nerves or controlling anxiety stimulating symptoms. Although it might not completely hamper your focus and energy levels, it will cause the usual drying out of eyes and mouth. This particular medical marijuana is grown indoors. It is observed to contain a THC level of 14-18% and a CBD level of 0.23%. In terms of physical features, it is shaped like pine trees and looks dense in its structural form. It is quite frosty looking and has dark green leaves. This particular medical marijuana is also thickly dressed up with orange hair all over it. It is most generally known for its sugary taste, as well as high potency value.